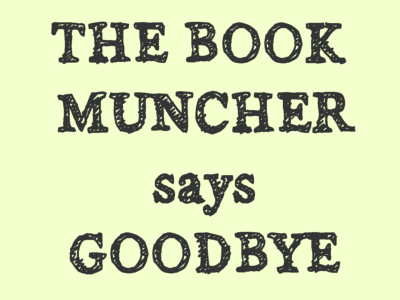 The Book Muncher The Book Muncher: What has The Book Muncher been up to? What has The Book Muncher been up to? You may or may not have noticed that my online presence has been a little sporadic of late, particularly on my poor little blog! I'm still running around, doing all things YA, but sadly I just haven't had the time to write about most of all that yet here. So what's been going on in my bookish life? 1. Lots and lots of book events. I have quite a few to recap (at least five!) featuring awesome authors like Robin Wasserman, David Levithan, Kass Morgan, Natalie Standiford, Sarah Beth Durst, Leila Sales, and many more. Look out for an upcoming post on those—once I organize myself and my pictures, the recap will be up ASAP! 2. Rereading the Gallagher Girl series by Ally Carter...again. I don't think it's much of a secret that I am a huge fan of books involving spies and crime (the more twisted and dangerous, the better! ), and Ally Carter's Gallagher Girl series is one of my favorites. I get very emotional reading these books. I will be very emotional once I finally read United We Spy, the sixth and final book in the series, which came out yesterday. My copy hasn't yet arrived in the mail, so I'm using this time to do another speedy reread of the five books that came before. 3. Preparing for more book events. A book fanatic like me is always aware of exciting upcoming events nearby. For me, that means the Brooklyn Book Festival this Sunday, where I will attend (and hopefully remember to document) four or five different children's book panels, as well as an event at Books of Wonder, one of my favorite bookstores, which features in particular the lovely Ally Carter. If you reference Number 2 on this list, you can see why I am way beyond excited. I even have a costume planned out. Anyway, thanks to everyone for being patient with me through my spotty attention at The Book Muncher; I hope to get lots more fun posts scheduled soon! Sounds like a dream come true! Patiently waiting for the next Gallagher Girls story here too! I reread all the Gallagher Girls before United We Spy, too. (Gallagher Girls unite!) We were lucky enough to meet the fabulous Ally Carter last year and still get giddy excited every time I think about it. The sixth one? Definitely emotional. Stayed up all night reading then had a cry fest because it was over (and awesome). Enjoy your book festivities and seeing Ally Carter!